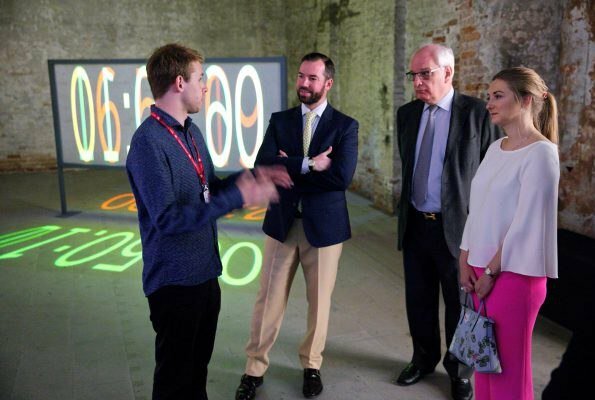 On the second day of their visit to Venice, Italy, Hereditary Grand Duke Guillaume and Hereditary Grand Duchess Stéphanie visited the "Viva Arte Viva" official exhibition at the Venetian Arsenal (Arsenale di Venezia) in Venice, Italy. 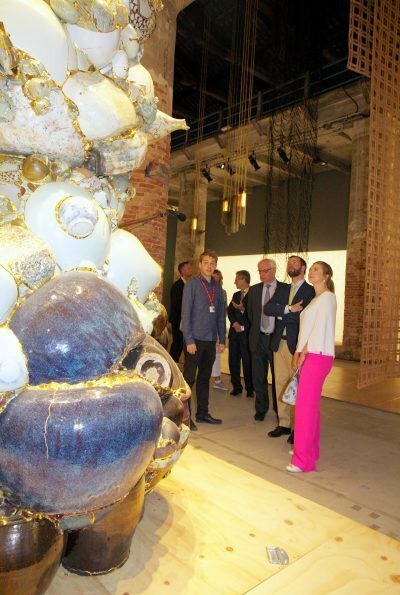 The Arsenale complex still operates in a much-reduced fashion for boat supplies, but part of the complex has been renovated to be used for Venice's elite Biennale art exhibitions. Living the top, not living the pants. The pink pants are rather cute. So much better than the black - still a bit too big but so much better. She looks fresh and her hair is quite nice also. 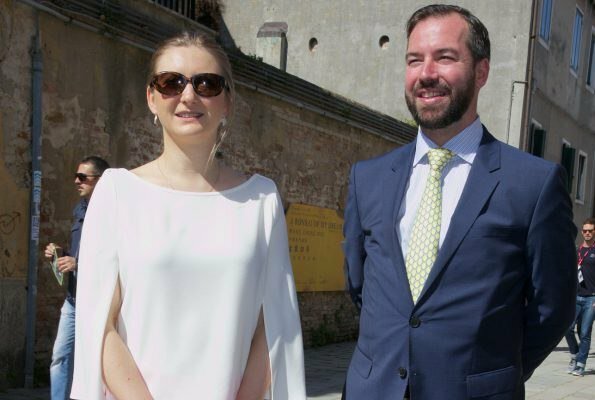 Le prince Guillaume sans ses lunettes,la princesse Stéphanie mieux habillée ,même s'il y a trop de pantalon ! En plein progrès les jeunes Luxembourg ! Would have been nicer if the pants were fitting and she teamed it with some heels...she's getting there. Wow that is PINK! The only issue is they are too long and little big. Again she needs a tailor. If only she would do this she would be killing many of her looks. That is a nasty and gratuitous comment. For my part, the pants are lovely and a striking departure for her. Lee Julie - not a nice comment at all. If you look over the past week it is very clear that Stephanie is NOT fat. Let's say that even if she was ? We do not go into that on this blog. It is true that as a fashion blog we might say this outfit or that outfit makes a person look bigger due to cut of a outfit etc. But we REFRAIN from personal attacks as to body shape here. Paula ~ I assume you are replying to Lee Julie? My comment was not nasty. I agree that the pants are nice. The color is WOW. They are little too baggy and long. But overall she looks nice. Totally agree Paula not to mention a load of rubbish. Well, i will hardly call anyone fat but if you saw Stephanie wearing the green dress a few days ago (particularly the third photo of the post) she is definitely carrying some bulge. For me it is no problem because i like real women but she is not very skinny, that is for sure. @lee Julie, she is far from fat. Thing is if she wore tailored trousers she would appear slimmer. These pants actually make her look big. Hi, Diane. Yes, I agree with your comment totally! Sorry if I gave you the wrong impression. Tailoring and proper length would make a huge difference!! Normally I hate the huge trousers she wears but I can live with these because they are such a glorious colour. The top is great and that bag and the flat shoes work here as well. She's looking good recently. I totally agree with you. She looks happier too I think. That's what I call shocking pink! I need sunglasses........... Rather nice tho. Wow princess..... She is cute in the pants.. Yes Franny! Glorious in pink! She seems a bit transformed--engaged, more confident and just happier. I actually like these brilliantly colored pants. They seem to suit this newer Stephanie. So the boring one-trick-pony (arts, arts, and arts again) and hubby are on the next little holiday paid by the Lux taxpayers. I wonder what MT is really thinking of her daughter-in-law. Have you actually ever said anything nice about anyone? She has a style all her own, personally shes lovely,graceful and adheres to a gentle softness that becomes her. Hmm, What Is Happening With Stephanie??? Recently her style has been looking so much more better than before and she's showing more self-confidence. Its a pleasure to watch her. Has she finally gotten some help with her clothes? 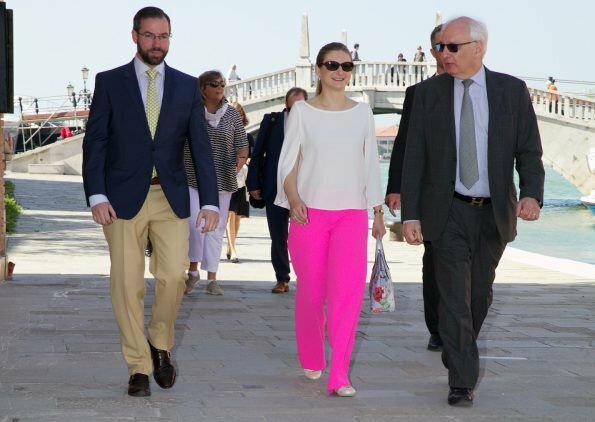 Okay, those are bright pink trousers but its well matched with her interesting white top and overall look is fresh and young. Very lovely! Elle est formidable ces derniers temps... et lui aussi sur ces photos! 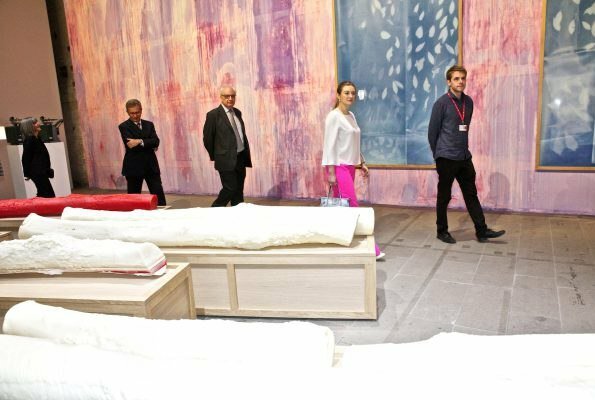 Que s'est il passé? Superb combination of pink and white! Love it! As others said she looks fresh and young. Some small improvements needed in accessoires and cut of the pants. But she is on her way. So nice to see her happy, relaxed and confident again. Grand Duchess looks great. I love that pants. Beautiful blouse. The colour combination is very fresh and attractive and i like the top but it would have been awesome of the pants where thight. Yes, great colour combination and with tight pants she would look perfect. I'm thinking someone has a new stylist! Yay!! I would have worn White palazzo pants & high heals. She needs a stylist.